The Wiz slot from the ELK Studios creative kitchen places you in the shoes of the wise, old sorcerer. The king relies on your aid for advice on all things magic, but today, your duties are a bit different. As the resident dragon-slaying knight called in sick today, it falls to you to defeat the fire-breathing lizard! To do so, you will need your magical tools, potions and baubles, which can all be found on the reels! The playing field is transparent, giving a gorgeous view of the picturesque landscape and the tall castle. The game is played on a 5-reel, 4-row layout with 178 ways to win. Special features include free spins, multiplier Wilds, swapping symbols and walking Wilds. Who will win the battle of magic and wits? Will the dragon crush you beneath its massive claws? Or will you lead the wizard to victory, and turn the dragon into your personal mount? This new 2019 title won us over visually from the moment we first saw it. The background image is a breath-taking visage. The fact the developers took the time to animate clouds being carried by the wind goes to show how much polish went into this ELK Studios slot machine. The medium-high volatility can provide some amazing jackpots, with the maximum win being 5000x your total stake. The RTP of 96.1% sits slightly above the current industry average, providing good value for money. The gameplay in The Wiz slightly suffers for the higher variance. At times, players will be faced with lots of dead spins and no way to escape them. If you lack patience, this will kill your momentum and cause you to give up midway through. We also wish there was a little more diversity in bonuses. After all, free spins and multiplier Wilds have been done plenty of times. The developers do their best to change up gameplay during bonus turns, but it, unfortunately, misses the mark. The slot has a total of four special features. 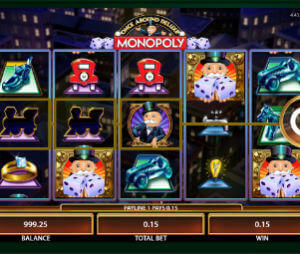 Two main bonuses, and two mini-features that only fire during free spins. When a Wild lands on the reels, it can appear with a multiplier between 2x to 5x. Wilds can substitute for all icons except for Wizard Scatters. 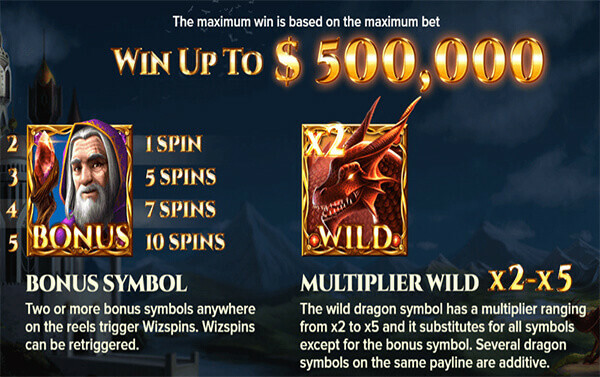 If multiple dragons appear on the same payline, their multipliers add up to increase the win. Collect two, three, four or five Scatters to trigger one, five, seven or ten WizSpins. Landing more Scatters while the bonus is already being played re-triggers the free spins. During WizSpins, there is a chance that all low-value symbols will transform into their respective high-value counterparts. The multiplier Wild also gains the ability to move, ‘walking’ one reel to the left for each free spin. The slot is a good all-around package, and your enjoyment will boil down to what you find most important in a game. Do you prefer huge jackpots, or fluid, fun gameplay? If big wins are your thing, then ELK Studios’ release will win you over quickly. It comes at a cost of somewhat dull gameplay outside of bonuses. If the developers could somehow fix that, it would make for an excellent title.